Stalling for the nosebleed-inducing climb to my walk-up apartment in schvitz-inducing heat, I check the mail, but it is not usually gratifying. During the ascent, I do often begin to thumb through the received parcels, and of course pause between the third and fourth floors to switch in my spare oxygen tank for the home stretch, to cope with the exhaustion and dense air. Of late, I’ve taken to reading the updates and flyers from the elected (and aspiring) officials in my neighborhood with more attention. For many people, these Albany updates, Congressional newsletters, and glossy direct mail pieces are the most political contact they have, if they do not actively seek out information about their local politicians. Now, I’ve written before about semi-personal touchpoints from politicians to their constituents. Senator Gillibrand’s letter to me was more underwhelming than North Korea’s World Cup performance. (Since then, I have seen the Senator up close and came away impressed.) Going through the motions on these things renders them pointless, especially when you use taxpayer money to produce them. Format and content are key. 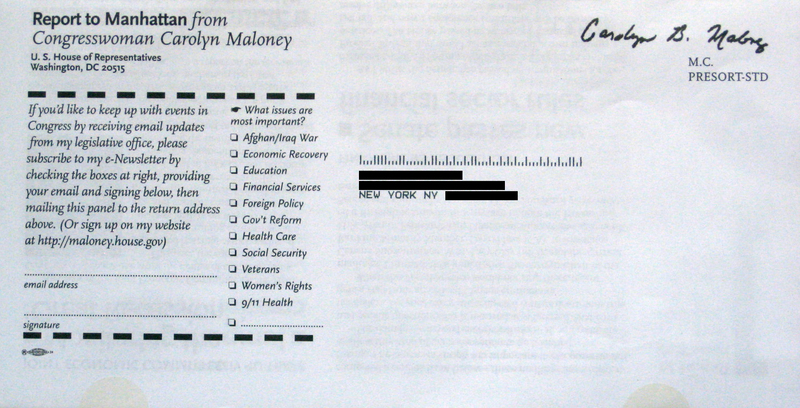 So, imagine my interest upon receiving Congresswoman Carolyn Maloney’s “Report to Manhattan” recently. It’s big and full of updates, predominantly related to financial regulation and the recession and a few other NYC-centric knick-knacks. 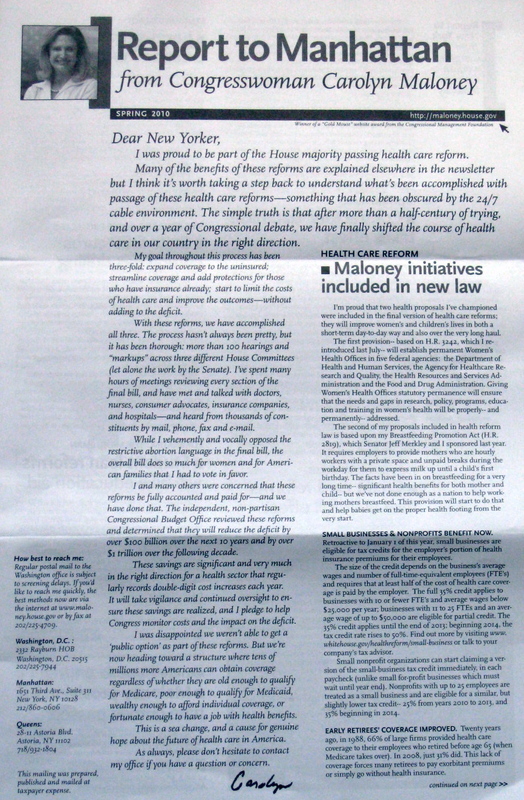 What caught my eye though, was the back page, which allows recipients to “keep up with events in Congress by receiving email updates from my legislative office” on the issues listed to the right. Of 11 issues, one issue is glaringly absent: climate change. I was pretty surprised to see this, especially from a tenured Democrat in a liberal district (Manhattan’s East Side and Queens). How did this slip by? The environment, energy, and climate change are vital to the nation and the world. The Congresswoman voted in favor of the clean energy legislation (aka ACES) that passed the House last year (and has eluded passage in the Senate for a year), so she is obviously not a man-made climate change denier. So, with a new study claiming 97 percent of scientists concur on the reality and urgency of this problem, why isn’t this a top 11 priority for her? I did some research by checking Maloney’s campaign website, because like all Representatives, she is up for election this year, and her official House website. Her campaign site highlights eight “issues,” if that’s what “Standing Up for New York” and “Putting People First” count as. Suffice it to say, climate change is not among them. In fact, the entire site has no mention whatsoever of the terms “environment,” “energy,” “global warming,” or “climate change,” that I can find. Her House website was not much better. I had to look closely to find two small sections for “Energy” and “Environment” that are sparse on content in comparison to other issues listed there. They do avail themselves of the four afore-mentioned terms, however. Miffed, I followed up by calling the Congresswoman’s office in Washington to ask if climate change is an issue of importance to her. The aide who answered said he couldn’t speak for her, but reminded me that she did vote for the ACES legislation. I explained how I could find nary a word on the topic in her materials, asked why that was, and said I really could not tell where she stands on these matters. (e.g. Does she favor a flat tax on carbon?) He noted my inquiries and exclaimed that he would pass them onto the Congresswoman. Don’t get me wrong. Maloney, who thought better of running against Gillibrand for Senate this year, has been in the House since around the time Bill Clinton came to town and has been an effective member in many ways. 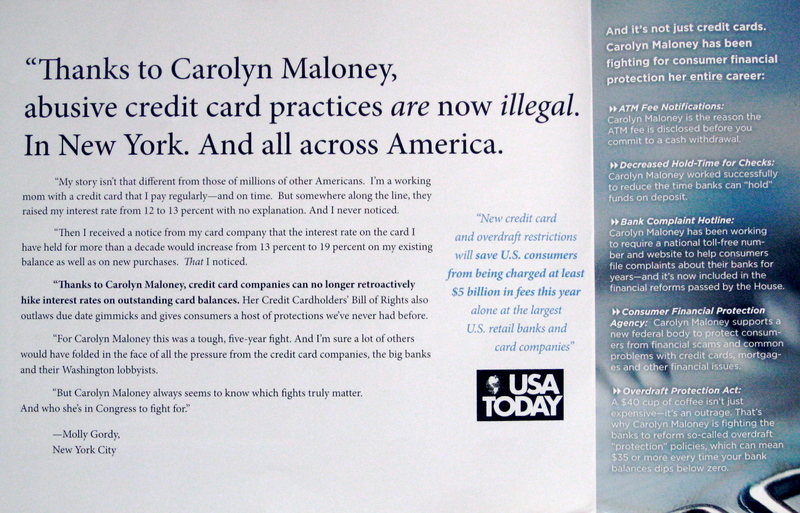 Most recently, she was the momentum-building champion of the credit card reform act that passed with a true bipartisan 357-70 vote in the House and led the way for the Senate to (for once) pass its bill, which is the version that ultimately became law. You’ve probably seen some of its effects laid out in your statements this year. However, before the larger financial regulation legislation came out of conference committee at the crack of dawn on Friday, I spoke to an an aide close to the conference committee negotiations who implied that Congresswoman Maloney, a high-ranking member, was “not a big player” in influencing the final Wall Street reform bill. 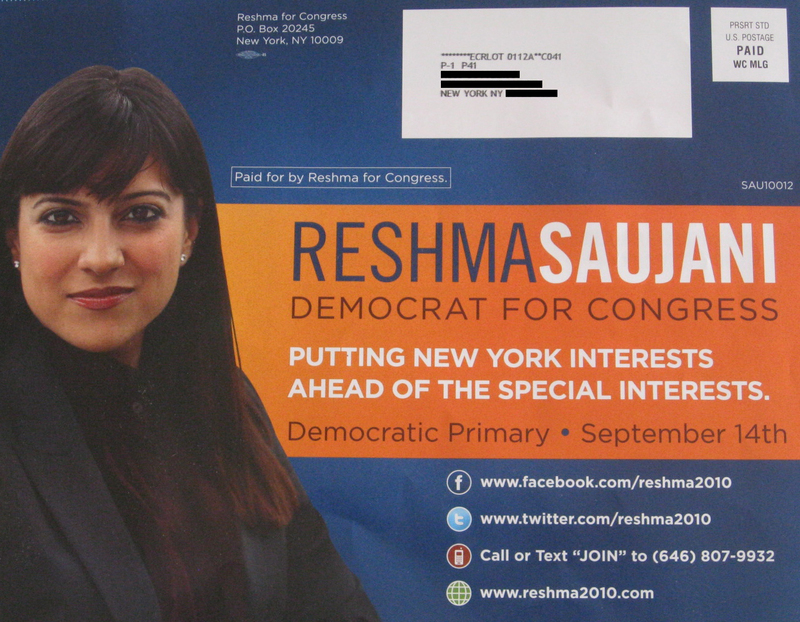 Of course, during my walks up the stairs I have also been thumbing through Maloney’s would-be replacement for her seat in New York’s 14th district, Reshma Saujani. Her family’s story has all the trappings of a riveting immigrant struggle against all odds that compels her to help others as a Yale-educated lawyer. Her super-smooth-and-shiny direct mail pieces tout her unwillingness to take money from special interests and her commitment to defending immigrants, reminding us once again, that yes, this isn’t Arizona. They also feature the now de rigueur unflattering picture of her opponent; in this case a shot of a bloated-looking Carolyn Maloney. In terms of issues, Saujani, who at a Botox-less 34 hopes to be the first Indian-American woman in Congress, does not overtly bring up climate change, either, but she does weave it into her national security and NYC infrastructure comments. Moreover, a couple of the things Saujani implies are murky or disingenuous. Yes, she isn’t taking corporate PAC money, but that is just money that employees give to their companies to donate to candidates that the firm deems worthy. It puts a corporate middleman between original donors and recipients. 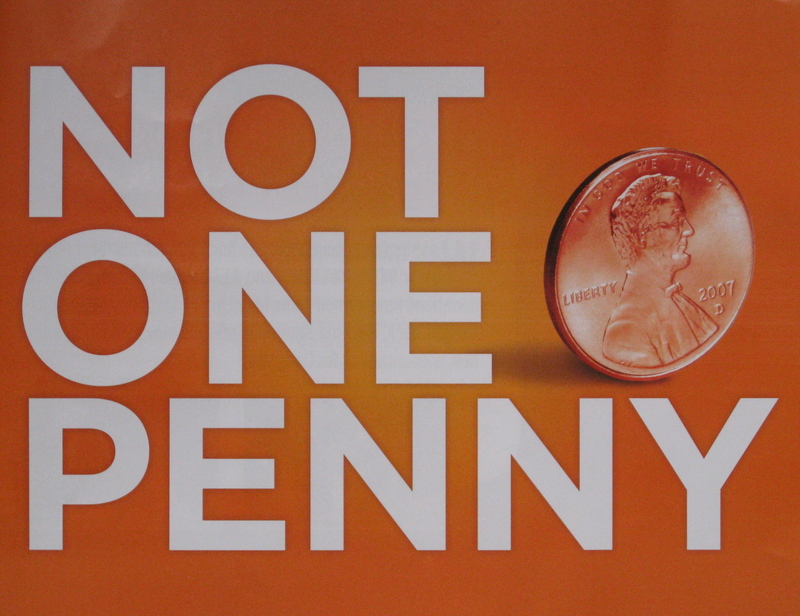 Those employees are still welcome to donate directly to Saujani… and they do. “For the first three months of 2010, the financial services sector contributed a third of Saujani’s $400,000 total, according to the Wall Street Journal. Donors included officials from Goldman Sachs, JP Morgan…” Sure, some employees donate without their company’s interests in mind, but some don’t. If you want to take that money, that’s fine, but don’t print out thousands of glossy brochures saying how you don’t take money from “special interests,” whatever the definition of that is today. 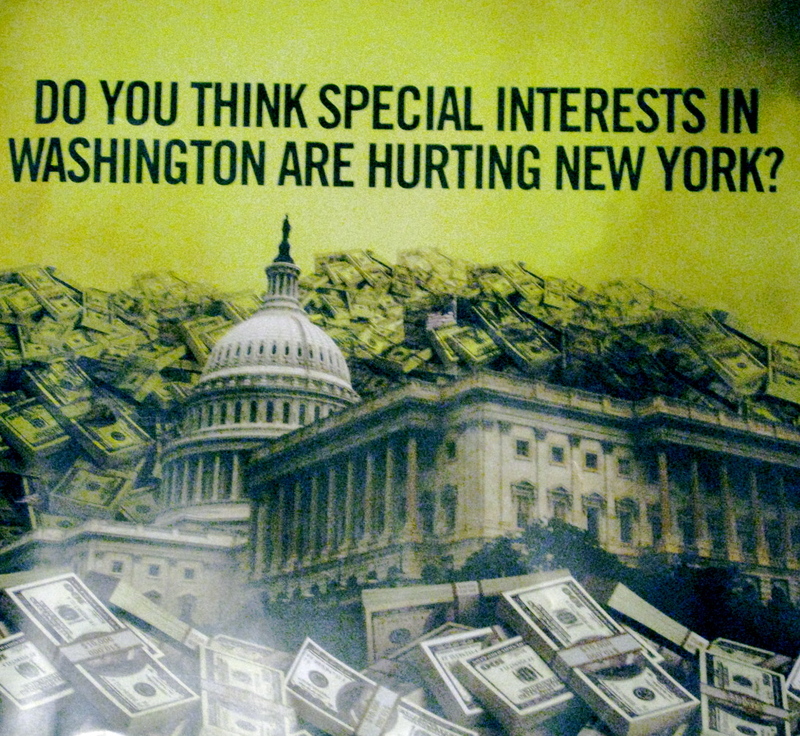 Also, there is further cognitive dissonance to the statement “Do you think special interests in Washington are hurting New York?” I love New York City and I love New York. But, when I think of “special interests,” the corporate bastions of power based here, in addition to the insurance lobby, Big Tobacco, Big Oil, and Hollywood, do tend to come to mind. I know Saujani is trying to say that the money is hurting average New Yorkers (and I’m not sure such a thing exists by the way), but many of those wads of cash make their way from Manhattan to the Beltway. I can definitely be accused of thinking too hard from time to time, but I end up considering the potential efficacy of those I vote for a lot these days. As an entrenched member of Congress, Maloney may be too comfortable, but she has gained seniority on a number of committees, and is Chairwoman of the Joint Economic Committee. Even if she was not the mover and shaker on financial regulation, this still affords her some clout. If Saujani wins, she will be hard-pressed to match that. And, the challenger herself said in May, “We are probably going to agree or vote the same on 80 or 90 percent of the issues… [but] the last time I read the Constitution, it didn’t say anything about waiting in line.” I like truth-telling from my politicians. But that truth undermines her candidacy. It makes it sounds like she is running primarily for selfish reasons, to fulfill her American destiny. They are both well-intentioned women trying to win a race, and they are each emphasizing what they are passionate about or what they deem will earn them votes. 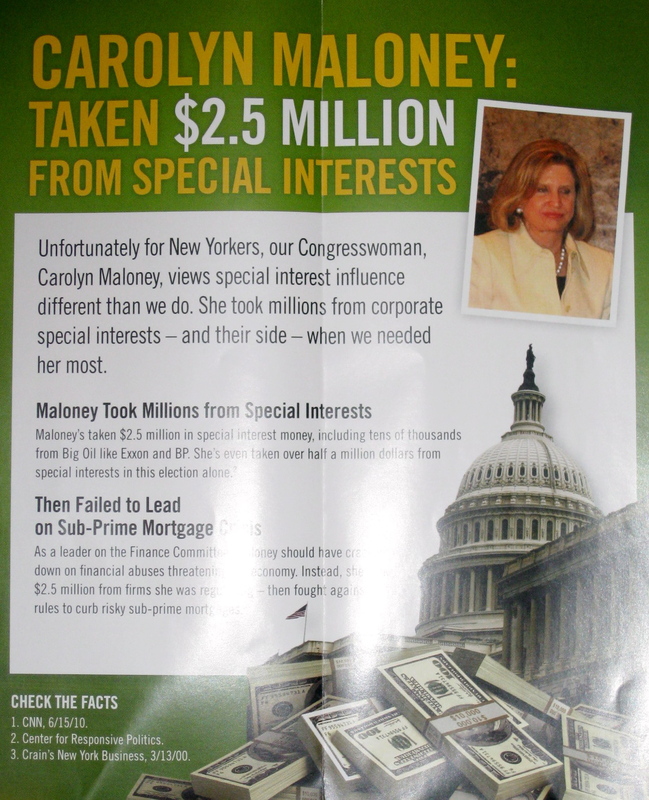 The thing is though, Maloney is a mostly good representative and she’s unscathed by scandal. If her taking some PAC money is all you have to say in this race, you’re not going to win. I’m not a one-issue voter necessarily, but the lack of substance on climate change from either of the women who will be my Congresswoman remains depressing. 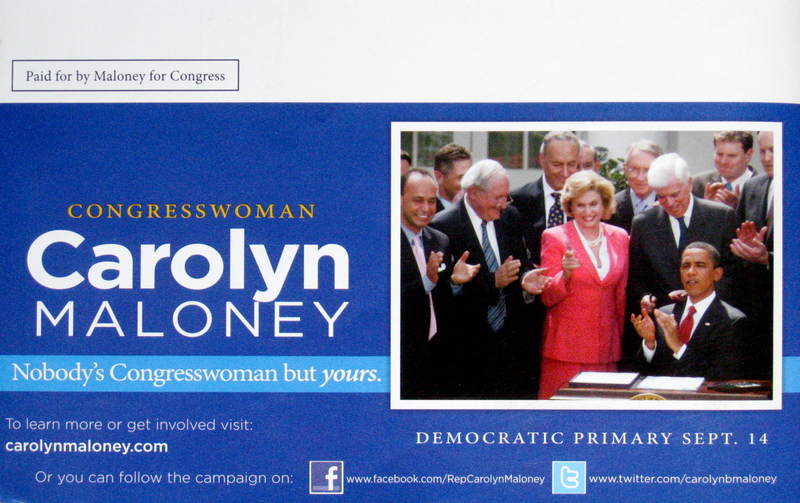 So, I wouldn’t say don’t vote for Carolyn Maloney in the September 14th primary (you won’t have to bother, it seems), but I wouldn’t count on her for much in the way of leadership on alternative energy and climate change. In closing, a toast to the pending Andrew Cuomo and Kirsten Gillibrand mailers I will be flooded with in a few weeks.